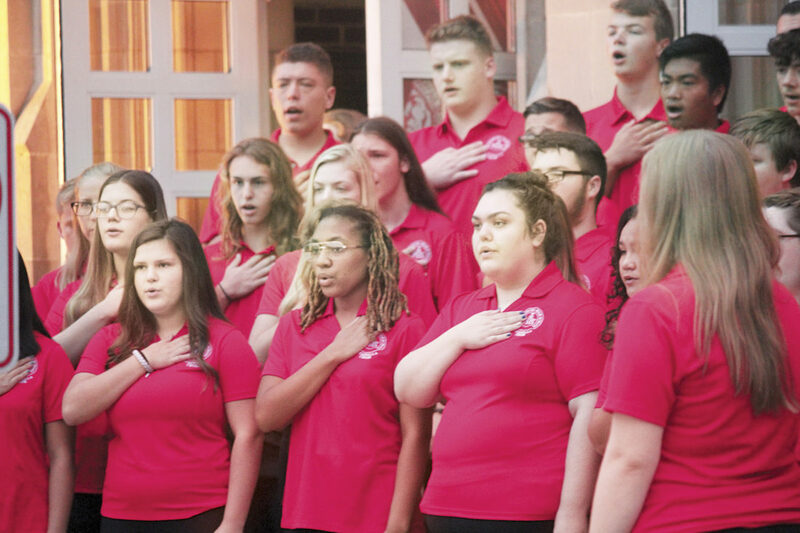 Photo by Michael Erb Members of the Parkersburg High School A Cappella Choir sing the National Anthem Tuesday morning during the school’s 9-11 remembrance ceremony. West Virginia Department of Military Affairs and Public Safety Secretary Jeff Sandy asked those gathered at West Virginia University at Parkersburg’s 9-11 Memorial Ceremony Tuesday to recite those words after listing the numbers of injured and killed during the terror attacks of Sept. 11, 2001. Sandy, the former Wood County sheriff, said 6,000 were injured that day, 2,606 who died at the World Trade Center, the 1,400 first-responders who have died since that day of exposure to toxins at Ground Zero since the attacks, the 343 firefighters who died that day, the 265 passengers on the four planes that were hijacked and used as weapons that day, 125 law enforcement officers who died during the attacks, the 55 military personnel who died that day and Wood County native Mary Lou Hague, who died in the World Trade Center. Earlier, Parkersburg High School held its 9-11 remembrance with a flag-raising ceremony performed by the PHS Naval Junior ROTC and songs by the PHS A Cappella Choir. Officials also spoke about Hague, a 1992 Parkersburg High School graduate who was killed in World Trade Center Tower 2. WVU-P held its 9-11 Memorial Ceremony with students, faculty and others in attendance to commemorate the lives lost and the lives saved during the terror attacks of Sept. 11, 2001 in which commercial airliners were hijacked and crashed into both towers of the World Trade Center in New York City, the Pentagon in Arlington, Va., and a plane that was bound for Washington, D.C. was crashed in a field near Shanksville, Pa., after its passengers tried to stop the hijackers. The school’s bell was rung by various people from the campus community with one ring for each year since the attacks took place. West Virginia University at Parkersburg President Chris Gilmer talked about the moments that define every generation. For some that was the Japanese attack on Pearl Harbor on Dec. 7, 1941, which brought America into World War II, a day that would “live in infamy,” according to President Franklin Delano Roosevelt. For others, it was the assassinations of President John F. Kennedy and Martin Luther King Jr. in the 1960s. ”Everyone who was alive during that time remembers where they were, what was happening and what they were doing in those moments,” Gilmer said. ”For my generation, certainly one of the defining moments was what happened on 9-11. Gilmer read the poem, “Invictus” by William Ernest Henley, which he said speaks to what happened that day and still speaks about what has always been good about the American spirit. Sandy, a 1976 graduate of Parkersburg High School and a 1979 graduate of Marshall University, talked about how every fall they turn off the Memorial Fountain at Marshall and every spring they turn it back on to commemorate the 75 lives lost in the Nov. 14, 1970 plane crash that killed the majority of the school’s football team and staff as well as commemorate the lives of the living who continue on. ”We do that because we cannot forget the past, but we must put a lot of emphasis on the future,” he said. He read the poem “We’re Still Standing” by Hannah Schoechert, seventh-grade student at the time of the 9-11 attacks, which he felt continually illustrates what happened that day and has happened since the attacks throughout America. Sandy commended the 6,831 American soldiers and four civilians who have died since 9-11 fighting the War on Terror across the world. ”We shall not forget,” those assembled said. Sandy recognized military veterans and first responders and spoke about the number of lives that have been saved since 9-11 because of America’s preparedness and those willing to make the necessary sacrifices to ensure this nation’s freedom. He quoted a speech by President Ronald Reagan which spoke about Martin August Treptow, a barber from Illinios who volunteered to serve in the Illinois National Guard which led him to the battlefields of Germany in World War I. During the fighting, Treptow volunteered to run a message to the commander of another unit. He ran through machine gun fire to deliver that message and initially survived, but another wave of machine gun fire came and he was killed. A diary he carried was found on him, stained in blood. ”That morning he wrote this passage in that diary, ‘America must win this war. I will work. I will save. I will sacrifice. I will endure. I will fight cheerfully and do my utmost as if the issue of the whole struggle depended on me,”’ Sandy read. ”How powerful is that, a barber from Illinois would write that on the day of his death,” he asked. As someone who volunteered to work at the Fusion Center in Washington, D.C., following 9-11, did work in Iraq during the War on Terror and who has worked with federal, state and local law enforcement, Sandy said the country is now safer than it was on 9-11.